During 2015, Jamie Keene (Engineer) carried out a survey of all eight PFCUs to check critical adjustments. There is one PFCU (effectively a hydraulic ram) for each elevon to move it up and down. Paul Hartrup (Trustee and Lead Engineer) has spent a great deal of time stripping down the PFCUs and renovating them where necessary over the past years, frequently replacing leaky oil seals. All eight units are now fitted back on board the aircraft but continuing adjustment is always needed. Each PFCU has an adjustment mechanism to make sure it operates precisely when the control stick in the cockpit is operated. The actual position of each flying control surface, the elevons, on the Vulcan's wing is indicated on an instrument in the cockpit so the pilots can see how they are aligned. All the adjusting elements have to be wire locked into place to ensure they don’t work loose during subsequent operation. 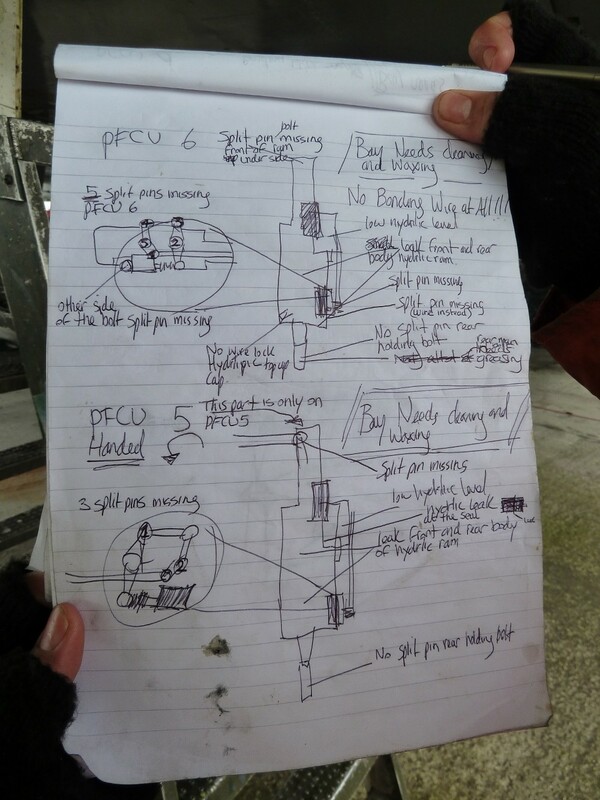 To ensure all the mechanisms, connecting pipes and wires are correctly fitted and secured, Jamie examined each PFCU and noted all the tasks which need doing. It is at this point that we must stress he is lucky; he is young and has a neck which can bend 90 degrees – backwards – as it involved standing on steps and peering up into each PFCU bay with a torch in one hand and a notebook in the other. And in case you would like to know what he wrote down, we caught him with notebook in hand and took the opportunity of getting a picture. Don’t worry, if you can’t read it – neither can we!